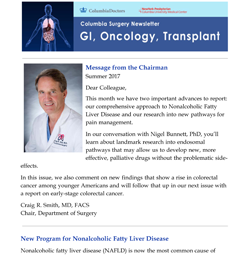 This month we have two important advances to report: our comprehensive approach to Nonalcoholic Fatty Liver Disease and our research into new pathways for pain management. In our conversation with Nigel Bunnett, PhD, you’ll learn about landmark research into endosomal pathways that may allow us to develop new, more effective, palliative drugs without the problematic side-effects. In this issue, we also comment on new findings that show a rise in colorectal cancer among younger Americans and will follow that up in our next issue with a report on early-stage colorectal cancer.